“Well I’ve never been to Iceland, but I really like the music.” Please excuse the Hoyt Axton paraphrase but this music brings joy to this listener’s heart. Wow! Even as a writer with an avowed fondness for music from the Nordic regions I am pleased to say that I am just stunned at this recording. This is all new music written in the last few years by Icelandic composers and performed by the Iceland Symphony which seems well prepared to handle these large works. These seven tracks document five works by living composers and, I dare say, rising stars in the classical orchestral realm as well. Only one of these composers is likely to ring a bell in all but a few listeners and that is Anna Thorvaldsdottir, probably the best known musician from Iceland since Björk. And it is worth noting that three of the five works are by female composers. There is a consistency in the large orchestral sounds from these composers that provide a unity for the listener and a challenge for the recording engineers. In fact this is ideal to show off the sonic facility of the Sono Luminus label and the skills of producer Dan Merceruio and recording engineer Daniel Shores. This is the sort of album that stereo salons use to show off the range of their amps and speakers. It is indeed thrilling to hear and the better your sound system, the more exciting this will be. Those blessed with Blue Ray Audio capability will doubtless get the best sound of all. Both standard CD and Blue Ray Audio discs are included in this package. In order of appearance the composers are: Thurídur Jónsdóttir (1967- ), Hlynur Vilmarsson, María Huld Markan Sigfúsdóttir (1980- ), Daniel Bjarnason (1979- ), and Anna Thorvaldsdottir (1977- ). 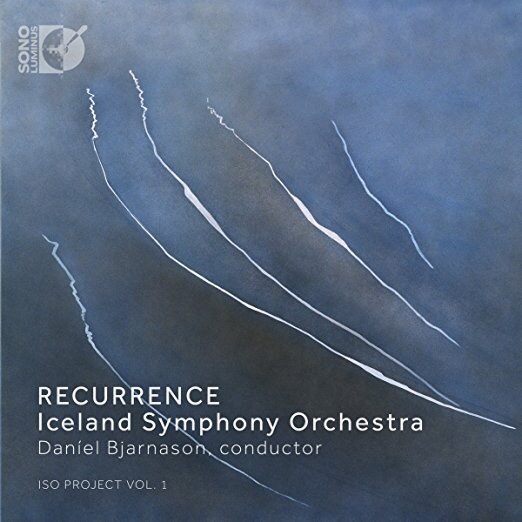 Bjarnason is also the very capable conductor of the Iceland Symphony in this recording. The music, Flow and Fusion, bd, Aequora, Emergence (three movements), and Dreaming are not given composition dates but are presumably recent compositions by these young artists. There are liner notes which are useful to the listener but the main point here seems to be the glorious sound. One hears influence and/or homage to some of the great sonic experimenters of the late 1950s and 60s like Penderecki, Xenakis, Lutoslawski and probably some Icelandic composers whose works have yet to be heard outside of Iceland. The album has the notation below the title of “ISO Project 1” so here’s hoping that there will be at least a second volume and that we be given the opportunity to hear more from the rich musical landscape of Iceland. Bravo! Brava! Keep it coming. This entry was posted in 21st century, classical music, composers, extended instrumental techniques, Iceland, Icelandic Composers, modern music, music, new music, new music, music, modern music, classical music, experimental music, new jazz, free jazz, john cage, composers and tagged Anna Thorvaldsdottir, Dan Merceruio, Daniel Bjarnason, Daniel Shores, Female Composers, Hlynur Vilmarsson, Iceland, Iceland Symphony Orchestra, Icelandic Composers, Lutoslawski, María Huld Markan Sigfúsdóttir, Penderecki, Sono Luminus, Thurídur Jónsdóttir, Xenakis.